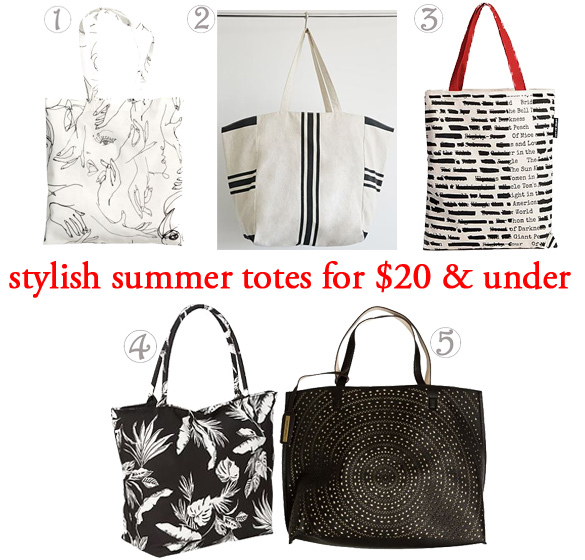 The Stylish Five: Totally Totes for Summer ($20 & Under)! When it comes to summer style, I love how accessories can instantly transform a look, especially one that’s day-to-night, changing for the many events on your calendar. I’m all about a good tote bag for when I’m headed to work, out to lunch with friends, to the beach for some sun, & then to drinks later on. Also, I think a chic & playful black & white tote bag will work with a variety of outfits, especially paired with bold colors in a maxi dress, shorts romper, or classic tee with cut-offs. Since Style Darling is all about affordability, I’m excited to share these five totes that are priced $20 or under! SHOP: 1. patterned tote ($9.95) @H&M, 2. striped textured cotton tote ($10.43, was $14.90) in cream / black @Forever 21 (also available in cream / red & cream / mustard), 3. banned books tote bag ($18.00) @Uncommon Goods, 4. tropical print tote ($19.00, was $19.94) in white palm print @Old Navy, & 5. reversible lasercut tote bag ($19.49, was $64.95) @Swell. What kind of handbags do you like to use in the summer? Where do you shop for the best seasonal deals? How much do you invest in accessories? For more stylish posts, check out celebrity-inspired fashion with Darling of the Day posts featuring Chloe Grace Moretz, Lily James, & Cara Delevingne, as well as must-have statement jewelry & the entire lookbook for Eddie Borgo’s new collaboration with Target. Happy Styling! This entry was posted in Accessories Access, Basics for a Bargain, Quickie Darling Deal & Steal, Style Darling Daily, The Stylish Five and tagged Accessories Access, affordable fashion, Basics for a Bargain, fashion, fashion blogger, Forever 21, H&M, Old Navy, Quickie Darling Deal & Steal, shopping, style, style blogger, Style Darling Daily, style for days, Swell, The Stylish Five, tote bags, Uncommon Goods. Bookmark the permalink. ← 06/26/2015 Darling of the Day: Chloe Grace Moretz’s Coach Tee & Leather Mini Look for Less!